Convinced that these rich but highly threatened habitats can only be conserved if human activities and natural heritage are reconciled, the Tour du Valat has been developing research and integrated management programmes for several decades. Its three-prong approach aims to provide concrete responses for key issues by: generating knowledge and sharing it to strengthen the capacities of those concerned, including users, natural site managers and scientists, influencing the effective management of these environments, and informing public policies. The Tour du Valat, which is located in the heart of the Camargue, is a private research institute with the legal status of a non-profit foundation that works in the public interest. The Estate, which includes all the natural habitats representative of the fluviolacustrine Camargue, covers 2921 hectares, 1845 of which are in a regional nature reserve. Beyond its role of conserving biodiversity, it is an ideal site for conducting research, and testing out and developing farming and hunting activities that are compatible with the conservation of this exceptional biodiversity. The Tour du Valat also houses a library focusing on wetland ecology, which is unique in the Mediterranean region. Every year, numerous researchers, professors, and interns from throughout the Mediterranean Basin come to consult the scientific works and resources in our library. The Tour du Valat has eighty-four employees who are involved in projects throughout the Mediterranean region. There are forty specialists on its team of scientists, who develop research programmes on how wetlands function, and test management processes that are adapted to the issues and specificities of Mediterranean wetlands. The results of this research are transferred via training and the innovative projects we conduct with numerous local, national, and international partners. Luc Hoffmann, of Swiss nationality, with a PhD in biology and a passion for ornithology, purchased the Tour du Valat Estate in 1948. After a few years of ringing and studying bird populations and waterbird migration, the Tour du Valat biological station was officially founded in 1954. From the start, the Tour du Valat partnered with other organisations to fulfil its mission to conserve waterbirds and wetlands. For instance, it housed the head office of the International Waterfowl and Wetlands Research Bureau (IWRB), which subsequently became Wetlands International, and developed conservation activities throughout the Mediterranean region. During the 1960s, under the guidance of Luc Hoffmann, who played an essential diplomatic role, the Tour du Valat initiated several international meetings through the MAR project to defend the functions and values of wetlands. To close the MAR project, which established the first scientifically objective description of the alarming disappearance of wetlands, a conference took place in the Camargue, during which the idea of an international wetlands convention emerged. 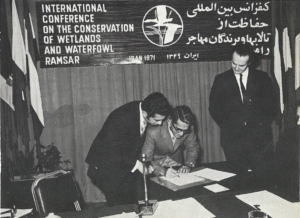 Nine years later, in 1971, the Ramsar Convention on wetlands was signed. It was the first international treaty on the environment. At that time, the Tour du Valat began diversifying its fields of research beyond ornithology to include wetland management by grazing and the ecological requirements of colonial waterbirds. In 1978, the Tour du Valat became a public interest private scientific foundation. In the 1980s, new integrated research programmes on vulnerable habitats and species were created with contributions new from disciplines such as hydrology and geomatics, which was just emerging at the time. A management plan was defined for the Estate, which was the first ever for a nature reserve in France. In the 1990s, the Tour du Valat developed conservation projects aiming to transfer the results of its research programmes, by means of wetlands management training modules that were organised throughout the Mediterranean Basin. In 1992 through the MedWet Initiative, the Tour du Valat started helping to apply and adapt the principles of the Ramsar Convention to the Mediterranean context. Today, socio-economic questions are becoming increasingly important in Tour du Valat programmes, which is resulting in much closer links between research and conservation jobs in France as well as in other Mediterranean countries. The Tour du Valat also provides support for making public policies and monitoring their implementation locally, nationally, and internationally. While the issues linked to the protection of Mediterranean wetlands and biodiversity have become all-pervasive in a context marked by accelerating global changes, particularly regarding the climate, the Tour du Valat has become a research institute acknowledged for its multi-level expertise. Over the years, the Tour du Valat has linked a large community of women and men, from all nationalities and origins and walks of life, in the Camargue, throughout the Mediterranean Basin and beyond. The Friends of the Tour du Valat Association was created in 2014 on the Tour du Valat’s 60th anniversary. It aims to federate the fabulous human capital embodied in the people who have woven the history of the Tour du Valat, and more generally all those who share its values, so they can discuss, share knowledge, and promote its ongoing activities. Anyone interested in becoming a member can join the Association. Luc Hoffmann purchases the 1250 ha – Tour du Valat Estate where mainly rice and wine is produced, while the pastures are rent to herdsmen. This observatory aimed at decision-makers and site managers reviews the state and responses of Mediterranean wetlands, which are facing anthropic pressures. 1,845 extra hectares of the Tour du Valat estate were listed as a Nature Regional Reserve.